Fun halloween trivia games are the best way to begin your fright night party. Play these as your guests are arriving. Have everyone work on them together so the conversations can begin. 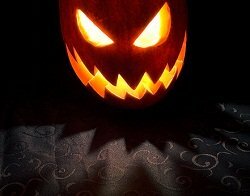 Other than the questions you will find in the halloween trivia games, here a little more fun facts and trivia about Halloween. Similar to Christmas, the term “Halloween” was originated from the Catholic Church and referred to as All Saints Day or All Hallows Day but even before the term “Halloween” was coined, it is believed that ancient customs began long before. The end of the Celtic year marked a day that was believed to be a day for all those who had died in the proceeding year to re-join the mortals and find a body to possess, causing hysteria among the mortals! It is understood that to avoid being taken over by a spirit... mortals would try and make their homes as cold and unwelcoming as possible and disguised themselves as demons or ghouls. It is also believed that on this grave day a person who was believed to already be possessed by a spirit would be burned to death. The above description varies a significant amount from our traditions today of candy, dressing up for fun, and playing tricks on each other and it wasn’t until Irish immigrants came to America in the 1840’s that Halloween as we know it today was created. Back in the Medieval Ireland they used turnips to make their jack-o-lanterns! Of course nowadays we use pumpkins to make our jack-o-lanterns. Ever been told its bad luck to see a black cat? Black cats became a popular Halloween symbol of bad luck because they were associated with witches and that witches could transform themselves into cats. And what is with the broom? We always see artwork with witches flying away on a broom. Did you know that witches are said to fly a broom through the air to symbolize the ability to blend domestic life with an ability to visit other dimensions? The popular use of UNICEF boxes today are used to collect donations for children who are less fortunate but I bet you didn’t know that in the 1950’s during communist hysteria, a few schools actually banned UNICEF from coming to their campuses fearing that they were communist supporters!